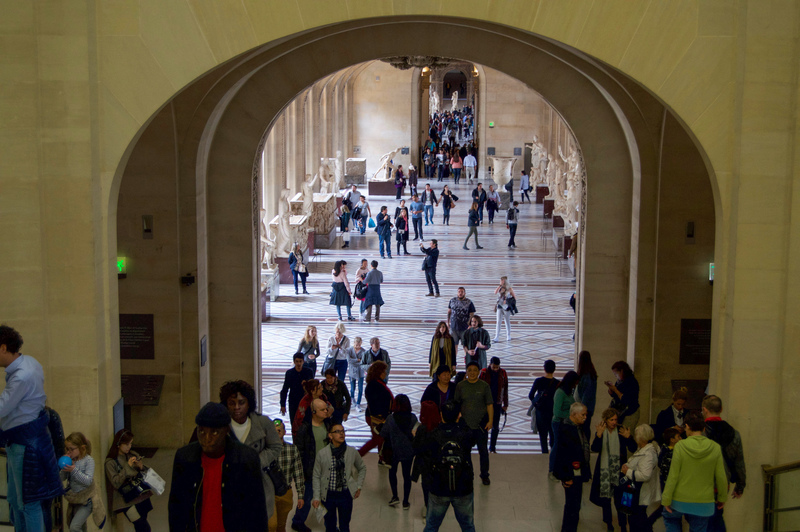 The next day it was time to tackle the Louvre! It was my third time there yet still I always underestimate how long it will take to see everything I want, and as a result always end up feeling both tired and frantic at the end of the visit. Chris’s opinion is that you need more than a day to see everything, but also that he wouldn’t want to spend another day there because it’s too exhausting. Anyways, Chris thought it was going to be all paintings, so was pleasantly surprised by the amount of Greek and Egyptian stuff. 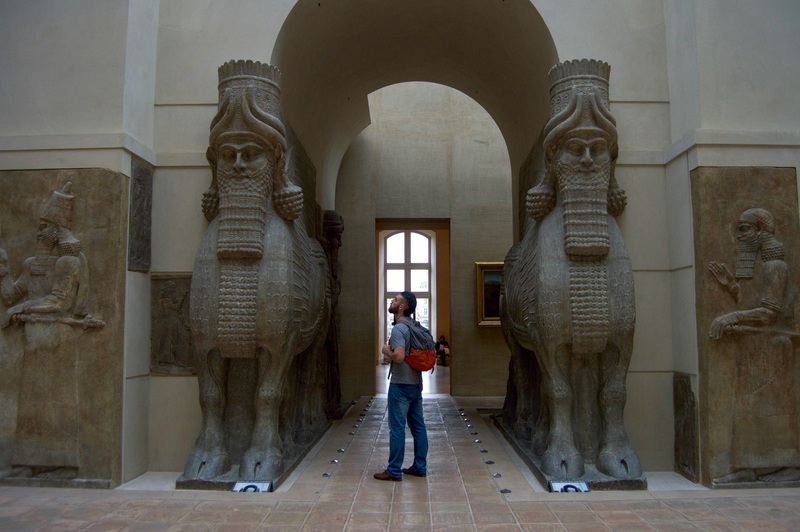 His favourite was the Book of the Dead and all the mummies, and also seeing the old walls under the museum. We also of course went to see the classics like the Mona Lisa, the Venus de Milo, and Winged Victory. Chris was confused why some paintings are more famous that other paintings of seemingly equal quality and insisted on looking at all the random non-famous stuff instead. 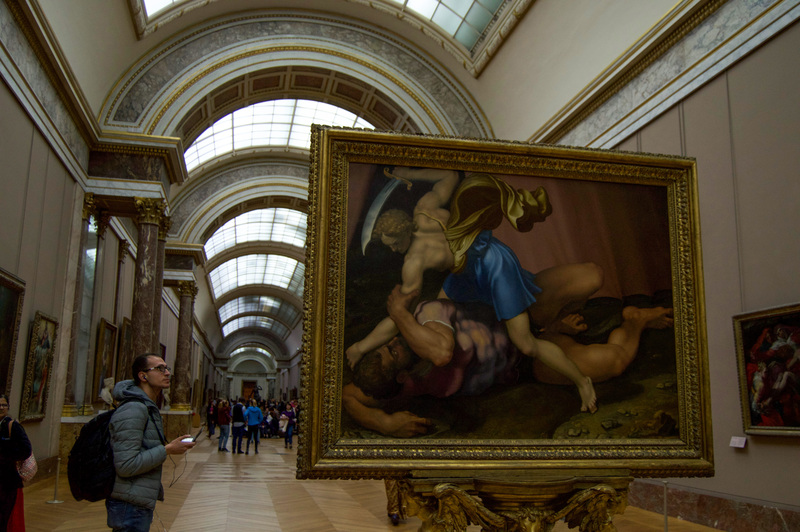 He also doesn’t understand the point of taking pictures of paintings when you can get a better one on the internet, so we didn’t spend very much time in the giant crowd around the Mona Lisa. But he may have just been grumpy because he was dying of tiredness by that point. 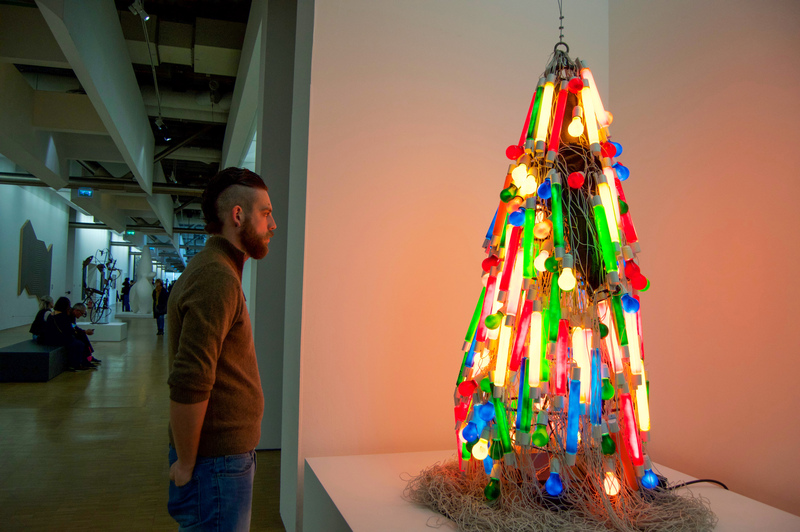 We decided to continue our art extravaganza (since that’s basically what Paris is all about) and go to the Musée National d’Art Moderne at the Georges Pompidou the next day. 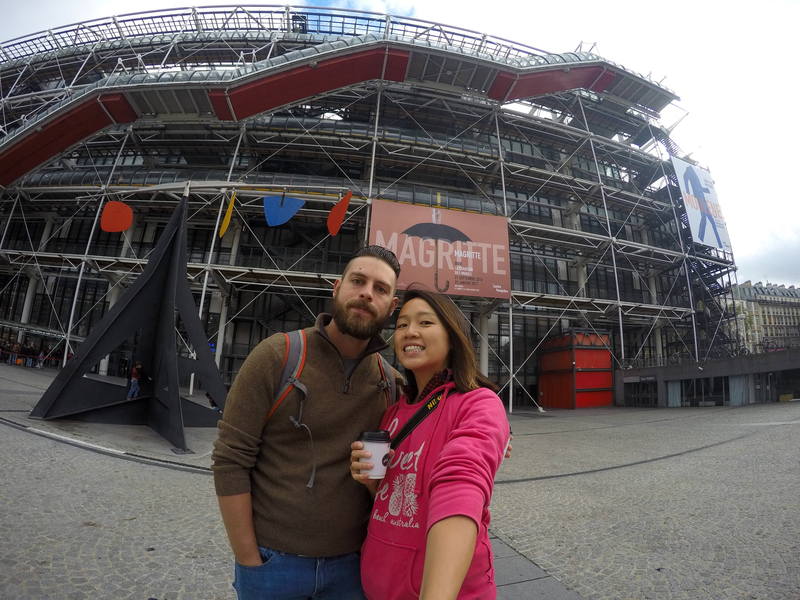 I like the Georges Pompidou because you get to go up those cool see-through escalators to get to the exhibits. The main part of the museum is organized in a chronological progression showing the different movements in modern art. Chris liked the earlier stuff better, and stopped understanding what was going on at about surrealism. He thinks minimalism is ridiculous. 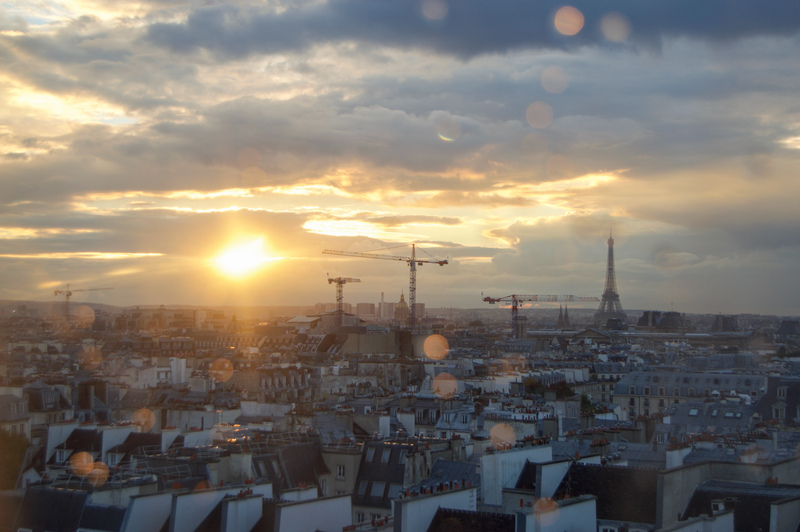 View from the Georges Pompidou. 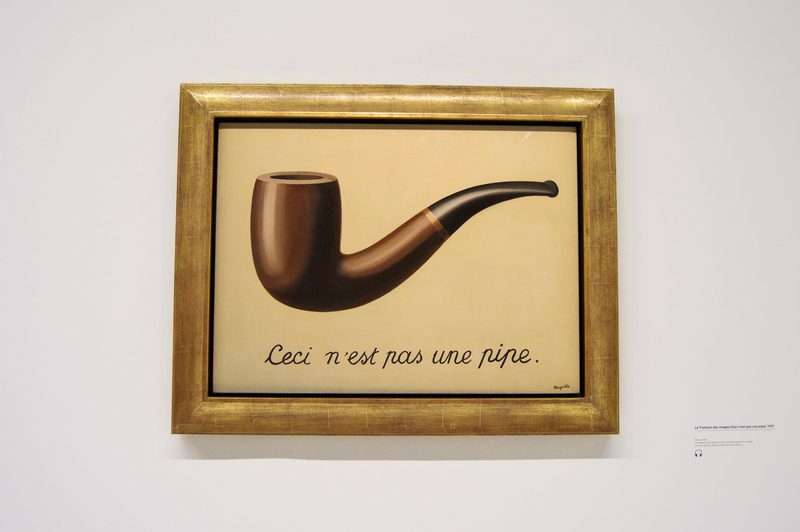 There was also a special Magritte exhibit on, which was SO BUSY but also had a lot of iconic paintings, the centrepiece of the exhibit being “This is not a pipe/Ceci n’est pas une pipe”. Our takeaway was that Magritte sure did like to paint the same things over and over again. He is all about the symbolism that guy. We were slightly disappointed they didn’t sell upside down umbrellas in the gift shop though. 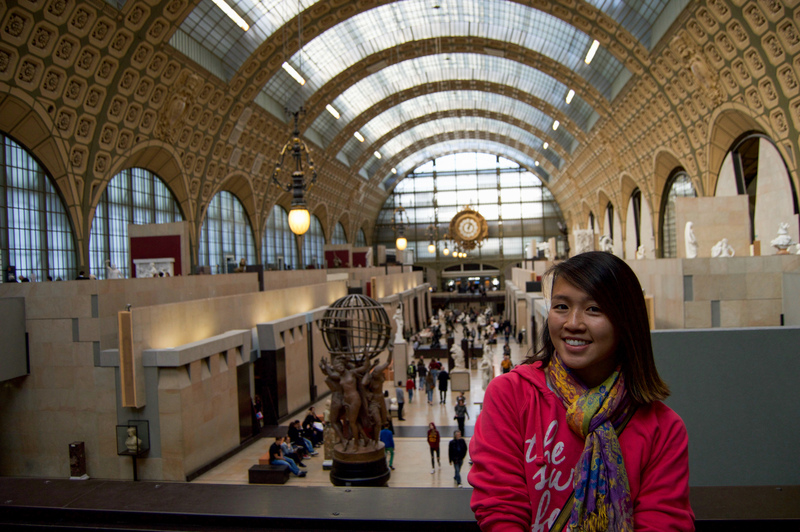 We continued our art trek the next day at the Musee d’Orsay. This one was our favourite, because it’s not too classical but also not too modern. All the famous impressionist stuff is there, like Van Gogh, Renoir, and Monet. The museum is also in a gorgeous old railway station. Chris was a bit grumpy because a bunch of stuff was closed due to it being off season, though I’m not sure we would have had the stamina to see it all anyways. 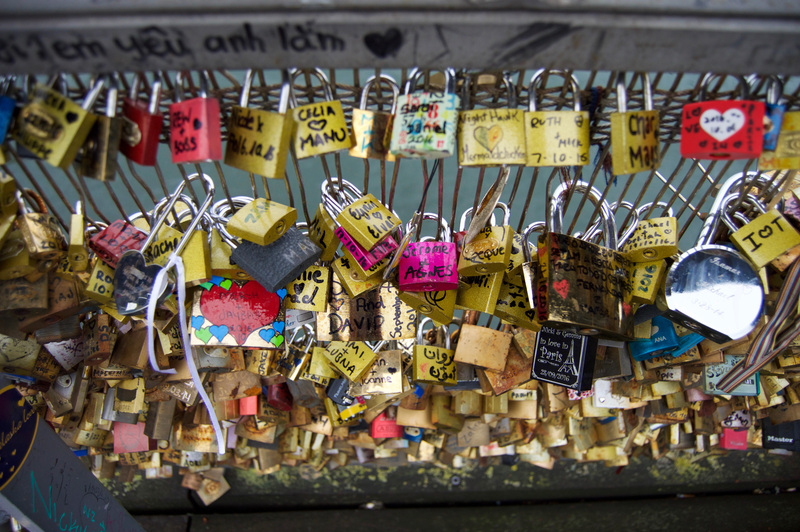 Afterwards we took a walk down the river and over to the Arc de Triumph and the Champs Elysées. 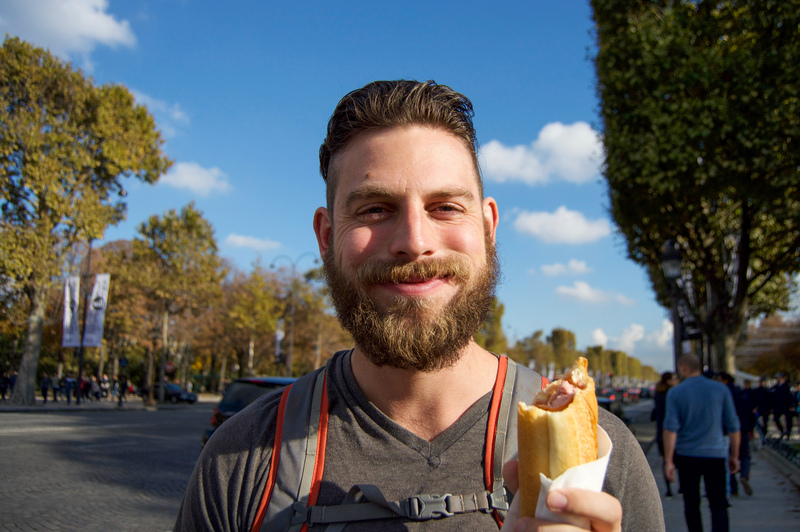 Chris got a hot dog along the way and was very excited to discover that it was made by poking a hole in a baguette and sticking the hot dog inside. 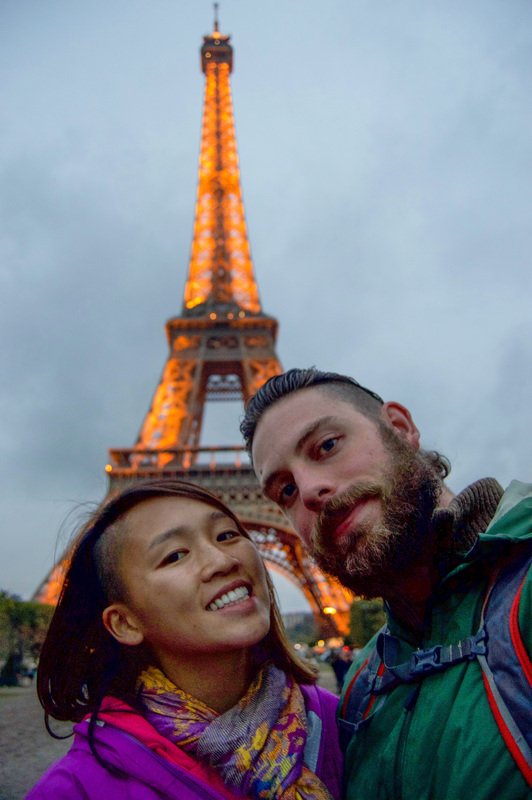 We ended our walk at the iconic Eiffel Tower. Chris vividly remembers this day as the one where he missed seeing ScarJo at the opening of her popcorn shop because we found out about it too late. Hot dog in a baguette? 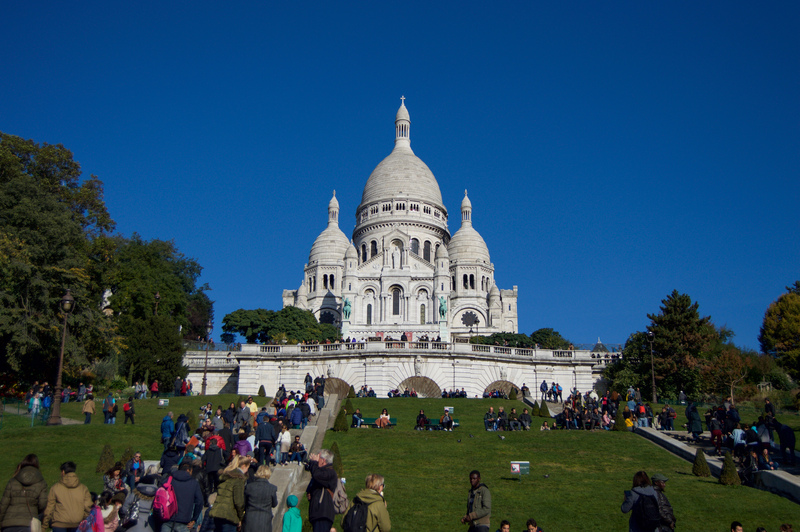 The next day we decided to take an art break and walked over the the Sacre Couer and Moulin Rouge. There were about a million people outside so we didn’t stay too long. 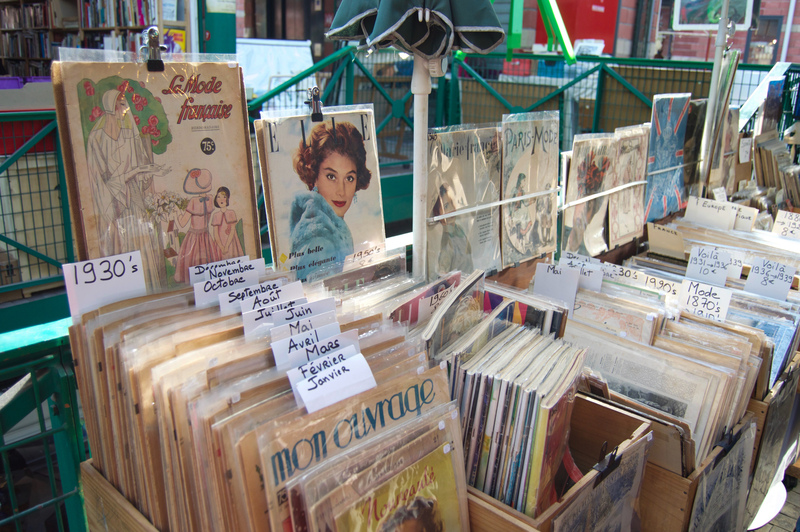 Instead we headed over to Les Puces de Saint-Ouen, a massive flea market. It’s actually a huge area composed of a whole bunch of different markets, vaguely organized by seller. We walked swiftly through the area with all the antique dealers selling fancy and very expensive Louis XVI style furniture and over to the more random/affordable part. 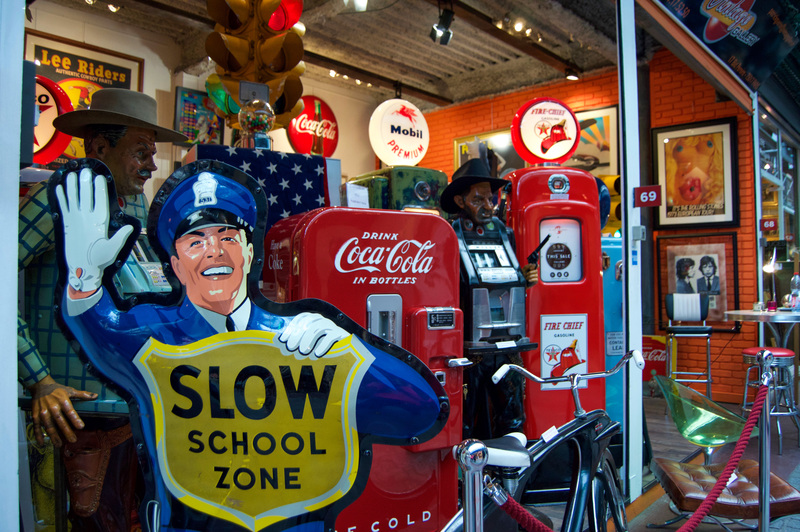 There is tons of cool stuff there, like old postcards, records, tin signs, skeleton keys, vintage clothes, telescopes, etc. We spent a lot of time pointing out things my dad would have liked. 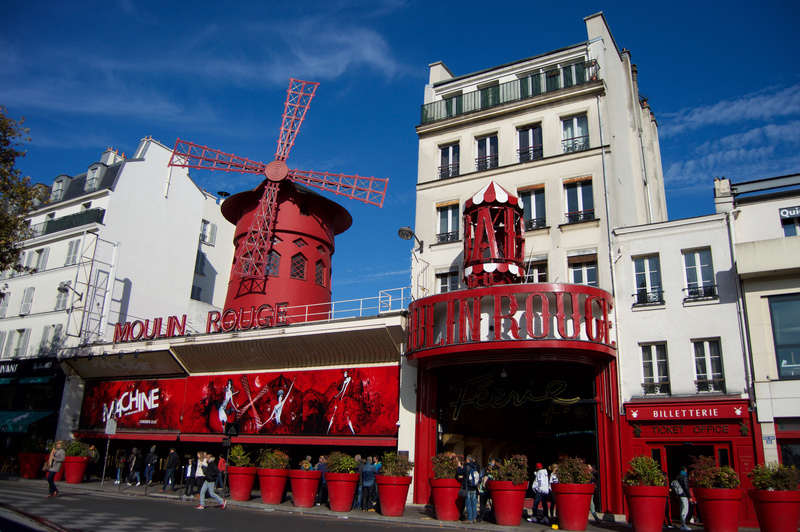 Shops at Les Puces de Saint-Ouen. On the edge of the flea market there is also a big, slightly sketchy area full of people selling knockoff Converse shoes and Canada Goose jackets. I didn’t know that was a thing, but after seeing it we became acutely aware of the number of people wearing those jackets. As a Canadian person, the idea of wearing a Canada Goose parka when it’s 15 degrees out seems ridiculous, but maybe the fake ones are not so warm. On our last day we decided to check out the Musée de l’Orangerie, an art museum I hadn’t been to before. 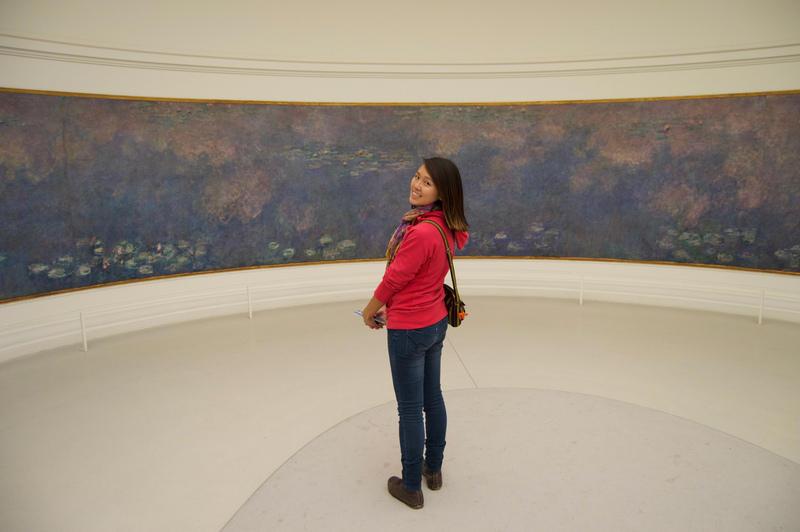 It’s pretty small but famous because it contains Monet’s iconic Water Lilies. They are permanently housed in these big round rooms specially constructed to Monet’s specification. Water lilies at the Musée de l’Orangerie. The rooms are entirely white, lit by natural light, and people are told not to talk inside to preserve the ambiance. The number of people in there taking panoramas with their iPads made Chris facepalm a bit, but the paintings were pretty impressive. Downstairs there was also a bunch of other impressionist stuff, which we went through pretty quickly, having already visited the Musée d’Orsay. 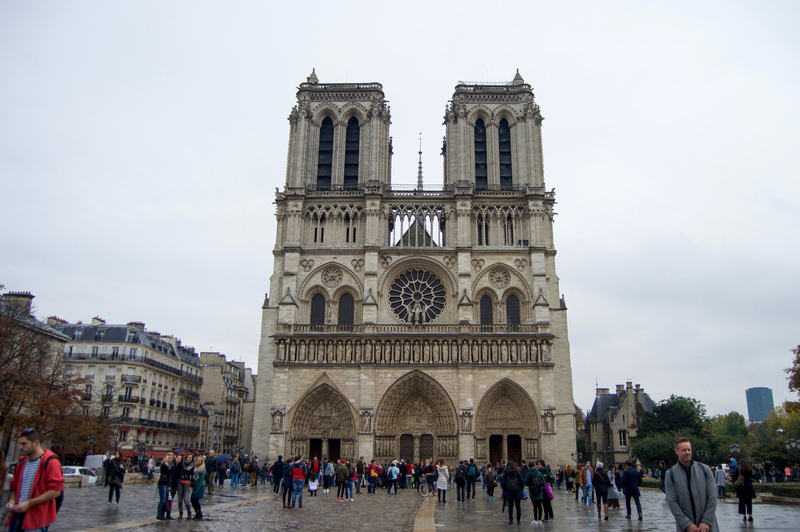 Afterwards we strolled over to the Notre Dame, along the way passing one of those bridges where everyone leaves love locks. At the cathedral we figured we’d also go inside since it was a bit rainy out. 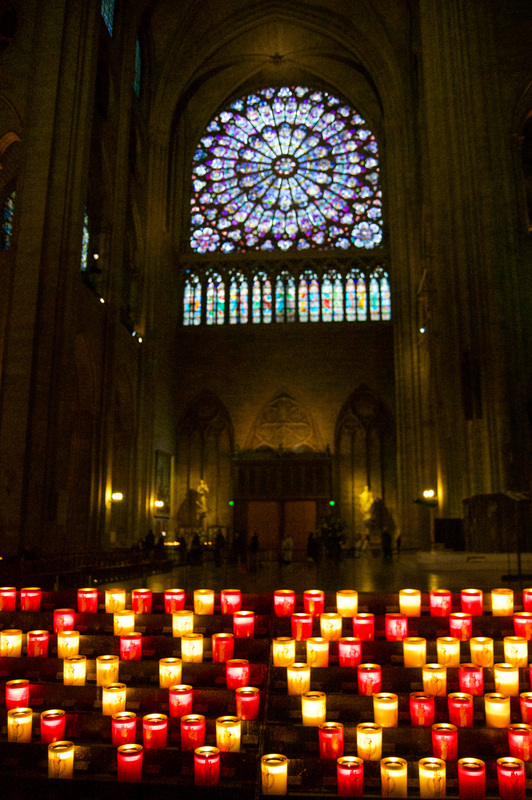 Chris loved it in there because it was “very atmospheric and godly”, in his words. 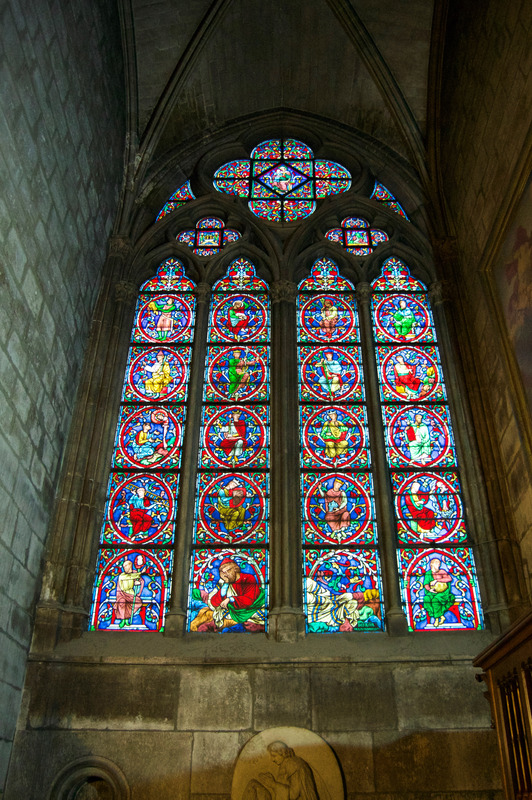 It’s cavernous inside and the stained glass windows are pretty amazing. 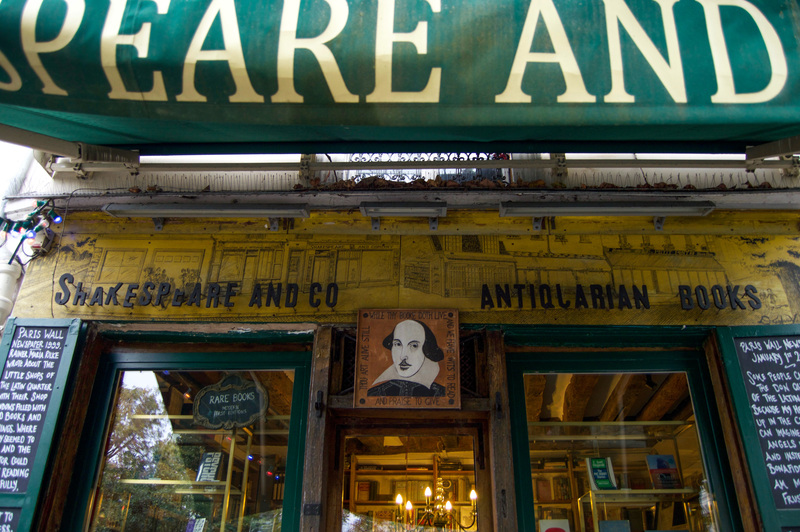 Across the street is Shakespeare and Company, a famous old English bookstore that’s a crazy narrow twisty maze of bookshelves inside. Back in the day it was frequented by famous writers like Hemingway, and today still offers free accommodation to aspiring writers. 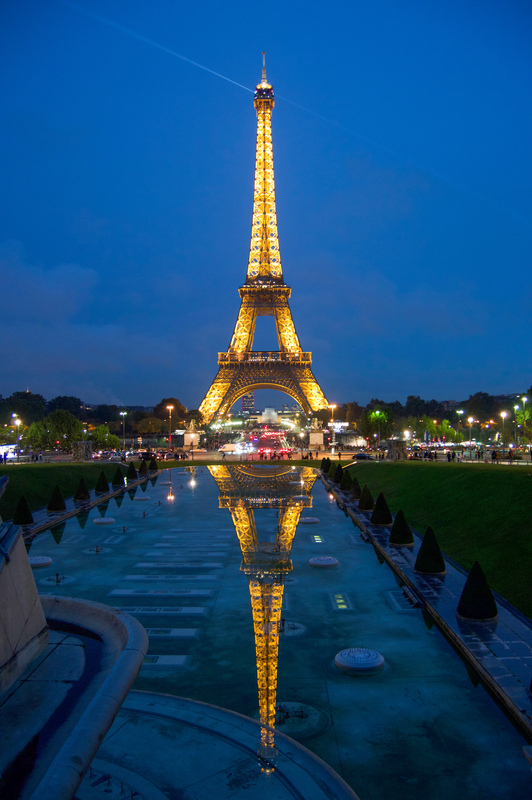 Since it was our last night we decided to go see the Eiffel Tower light up. In addition to regular lights, it does this thing every hour where it gets all sparkly. Exciting! We didn’t stay too late because the next day, we were leaving for Morocco at a freakishly early hour!